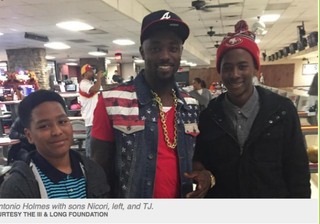 Santonio Holmes with sons Nicori, left, and T.J.
NFL player Santonio Holmes knows the pain of sickle cell disease. He sees it in his 11-year-old son, T.J., as the boy struggles against the blood disorder that primarily affects people of African descent. A disease that causes intense pain and even life-threatening situations, it’s a tax on the body and the wallet as families often scramble to pay for expensive treatments. Holmes wants to change that. President of the III & Long Foundation, Holmes was in Washington, D.C., recently to meet with members of Congress and health care influencers, advocating for sickle cell research, awareness and treatment. Sickle cell disease is the most commonly inherited blood disorder in the United States, according to the National Institutes of Health. It disproportionately affects African Americans and other minorities with ancestry from sub-Saharan Africa, South and Central America, the Caribbean, India, Saudi Arabia and some Mediterranean countries. SCD causes the body to produce hard and sticky, crescent-shaped red blood cells. Normal blood cells are disk-shaped and move easily through blood vessels. Sickle cells block blood flow in the blood vessels of the limbs and organs, which can lead to pain and life-threatening complications. Dehydration, poor diet, stress and extreme weather can trigger attacks. Those who carry the sickle cell trait often do not have sickle cell disease. If both parents possess the trait, then there is a 50 percent chance that their child will be born with the trait, and a 25 percent chance that their baby will be born with sickle cell disease. The disease occurs in about 1 out of every 500 African-American births. There is no cure for SCD, but comprehensive care has improved the quality and life span of patients. Twenty years ago, children born with SCD rarely lived to become adults. Patients can now live a long, productive life, but those with the most severe form of the disease may have a two- to three-decade shorter life expectancy, according to the World Health Organization. Treatment is costly and not readily available. According to the Sickle Cell Disease Association of America Inc. (pdf), SCD is a major public health concern, with an estimated health care impact of $2 billion. Between 65 and 70 percent of those with the disease are classified as low income or economically disadvantaged. And there is an overwhelming shortage of specialists who treat patients with SCD. Compared with similar genetic disorders, sickle cell research receives a disproportionately low amount of funding. According to estimates provided by researchers at the Johns Hopkins School of Medicine comparing sickle cell disease and cystic fibrosis funding in 2010 and 2011, cystic fibrosis, which affects less than a third as many people as SCD, received between 7.6 and 11.4 times more dollars per affected person from federal and private charitable sources of support. Between 2010 and 2013, five drugs were approved for use in the treatment of cystic fibrosis, and none were approved for the treatment of SCD. Carlton Haywood Jr., a bioethics and hematology professor at the Johns Hopkins Berman Institute of Bioethics who is living with SCD, says that there may be several reasons driving the low levels of awareness and research funding: Many people tend to think about SCD as a childhood disease, advocacy efforts by the sickle cell community have not been as effective as those in the hemophilia and cystic fibrosis communities, and many mistakenly believe that sickle cell is a condition that only affects one minority racial group. “They don’t realize that persons of any race or ethnicity are at risk for the disease, so they may not realize that everyone has a stake in improving conditions for the persons with the disease,” Haywood said. Holmes, who has lobbied lawmakers, hopes that they consider reintroducing the Sickle Cell Disease Research, Surveillance, Prevention, and Treatment Act of 2014, which would fund research, improve access to health care, and evaluate strategies for prevention and treatment.